Listening to Sultans of Swing in 1979 was one of the reasons I started to learn the guitar. From this time on I wanted to get that magic guitar sound. One major component for a guitar sound is the right string gauge. I guess you all have heard about using heavier strings to get a fuller sound. On the other hand thinner strings are easier to play, and they give you a different kind of attack which can be nice as well. For most of the big guitarists we know which brand and gauge they played during the different stages in their career. Of course we know a lot about Mark Knopfler’s strings, too, but unfortunately there is almost no information about his strings during the time of the original Dire Straits setup. And the guitar sounds of the first two albums are still the holy grail for many of us. Check this blog post for the earliest info we have, including the possibility that Mark played 008 strings. I personally change string gauge periodically. After playing thin strings for some time I start to miss something and sooner or later I change to heavier strings, and with heavier strings the same is true so that I go back for thinner strings again. This is why I recorded a video today in which I play the first Sultans solo with heavier and thinner strings for a side by side comparision. I used a 1983 Japanese Squier Strat on which I installed the Sultans pickguard with the VFS-1 pickups. It seems Mark played a DiMarzio FS-1 (13k!) 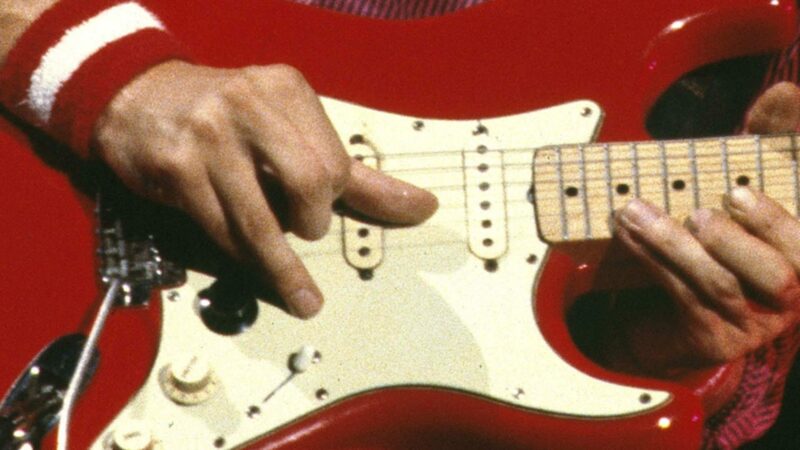 in the middle position of one of his two Strats in early 1978, combined with a normal Fender pickup at the bridge. With the ‘Sultans’ pickguard I can switch each of the three VFS-1 pickups individually to the DiMarzio or Fender sound. This is great as with a DiMarzio in the middle I would get new sounds but at the same time would lose not only the normal middle pickup sound but also certain flavours of the traditional bridge & middle sound. The same is true for a DiMarzio in the neck position – this is where Mark’s DiMarzio went to in October 1978. With the Sultans pickguard I have all these combinations, all normal Strat sounds plus any DiMarzio/DiMarzio or DiMarzio/Fender combination. 26 different sounds! I put new Fender ‘regular’ nickel strings (010 -013-017-026-036-046) on the guitar and recorded the solo over the backing track. Then I changed the three unwound strings to 009-011-015 and recorded it again (with some subtle volume and EQ adjustments to match the differences). I left the bass strings so that I do not have to adjust the trussrod on the guitar and do a complete new setup. I did not try with 08 strings (008-011-014) as these should be similar to the 009s. If the 009s sound clearly better, I thought to examine the difference between a 008 and a 009 and a 014 vs. a 015 later. I recorded the guitar straight through a treble booster into the mixing desk. You normally need a trebly amp setup (e.g. a vintage Fender or a Jazz Chorus) with a lot of reverb for this sound, plus a little bit of chorus. I added these ingredients in the recording software, just for convenience. Of course I cannot get the original sound 100% this way, as it requires a tube amp, some good microphones, a great recording room, a 1961 Strat, and more, but I was hoping to get something close enough to judge the strings. Maybe you should judge for yourself. You can let us all know which you think is better with the poll below, or use the comment option below this blog post to share your thoughts. Which strings sound more like the original - 010 or 009? Ingo, please come and visit me in Australia one day. I’d love to just hang out and play rhythm while you play what your heart tells you! I love his blog! It is really nice to have people who read and like my blog, and who you sometimes actually meet for a chat or a jam one day. Hey mate never doubt the people that love what you do. It’s worldwide and we REALLY appreciate the authenticity you promote, rather than just ‘fan love’. I was a champion to get this website linked on AMIT, but it’s not for my benefit, it for the people who want a true appreciation of the MK genius. That’s the work you do. Thanks Ingo. The 009 gauge sounds better in this case. I Believe that MK plays 009 strings during that time. That “thin” sound, in my opinion, came from 009 strings. I play Sultans with 011s and using only the middle pickup. I have an “copy” of the Mark’s Black Pensa with Emg pickups but this pickups are not real fat, so the 011 gauge give me an “extra punch”. thanks a lot for this (as usual) excellent blog post! Much appreciated. I cannot decide which string set sounds better. The sound of the 010 strings is rather full … more than the 009 strings. The 009 strings however are definitely more “singing”, which reflects Mark’s style of these days very much.